One in 10 of the airline’s pilots are now female. 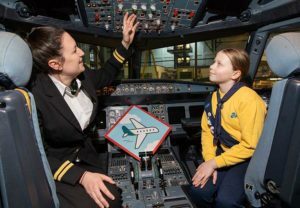 Aer Lingus has teamed up with the Irish Girl Guides to create the ‘Aviation Badge’ to encourage girls to get interested in science and technology subjects in school and consider future careers in the aviation industry. Irish Girl Guides has around 12,000 members in Ireland. The partnership will provide three Aviation badges, one for each level of Girl Guide: Ladybirds (aged 5 – 7); Brownies (aged 7 -10); and Guides (aged 10-14). Ladybirds must colour in a picture of an aircraft and make an object that flies such as a paper plane or kite. Brownies will research different careers linked with aviation and air transportation, investigate innovative women in the history of aviation and learn the phonetic language of Aviation. Guides must research the job of pilots, including what education and skills are required; test their engineering skills by creating aircraft experiments and challenge them to think of things that fly and how. Aer Lingus was the first airline in Europe to employ a female pilot, and currently, Grainne Cronin back in 1977, and employs twice as many female pilots as the international airline industry average. It is making an effort to encourage a greater number of women to apply for roles that have traditionally been male-dominated via their Aer Lingus Future Pilot Programme, the Aer Lingus Apprenticeship Scheme as well as opportunities in airline operations.